Sometimes – not all the time, mind you – it’s nice to see a film play a narrative completely straightforward. There are instances where filmmakers will try to paint too far outside of the lines, blinded by their ambition to be different. As a result, the final product will feel bloated, befuddling, and at worst meaningless. Sometimes it’s relieving to see a story told traditionally, where it doesn’t try to be anything more than what it is. A simple story done well can be just as successful as one that tried to reach for the stars and missed in grandiose fashion. For example, this year’s Cinderella brought nothing new to the table, but Kenneth Branagh did such an excellent job that it came off as refreshing. The same can be said about Far from the Madding Crowd (2015). 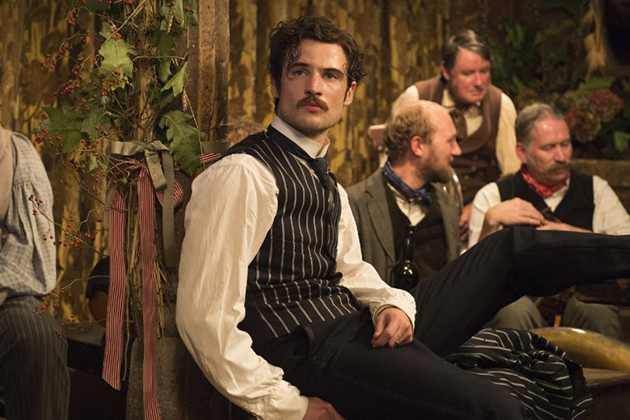 An adaptation of Thomas Hardy’s famous novel, this old fashioned romantic drama holds our attention so finely that we forget how familiar and predictable it is. This is one of those grand, sweeping tales of love, jealousy, class, and gender politics set in the backdrop of late 19th century England. We have farmers and field hands, soldiers, and large shots of vast open spaces. Comparisons to Gone With the Wind (1939) or Giant (1956) will surely be made. In fact, the only thing that separates this from the past is that it isn’t three hours long. I was surprised with how it hooked me in. Even more startling is that this was directed by Thomas Vinterberg, the Danish filmmaker best known for his Dogme95 effort The Celebration (1998) and most recently the fantastic The Hunt (2012) starring Mads Mikkelsen. These are dark, hard-hitting examinations of the very worst of human nature. If you were to tell me back then that Vinterberg would take on a more conventional turn with Madding Crowd, I wouldn’t have believed you. But here we are. Vinterberg (along with the cinematographer Charlotte Bruus Christensen) incorporate plenty of eye-catching visuals. The look is not bright and colorful like most romantic epics, but geared toward a naturalistic aesthetic. There are times where we see shots during the “magic hour,” where the sun is just setting to create a nice golden hue. But there are scenes where Vinterberg drops us right into the muck of things. These characters get wet and dirty, signaling that this was not an easy time to live in. 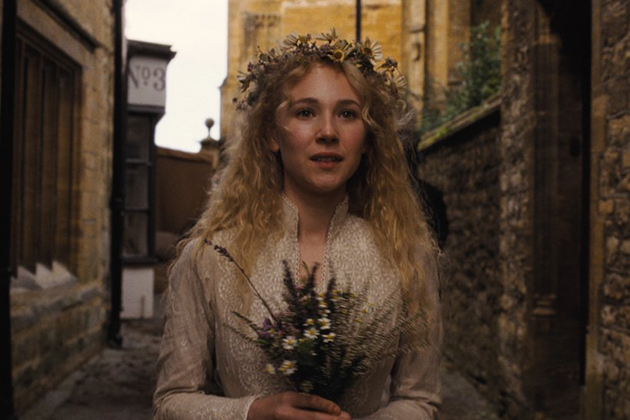 Our lead character is Bathsheba Everdene (Carey Mulligan). Bathsheba is a person full of contradictions. Born poor but inheriting a farming estate that could lead to wealth and prosperity, Bathsheba has a strong and independent personality but underneath is quite vulnerable. She tries her best to run the estate and manage her employees, but often goes along unsure of what to do. Her pride won’t allow her to admit her naiveté at being the head of a farm, but not to the point where she can’t ask for help. Bathsheba is a fascinating and layered character, and Carey Mulligan plays all her facets convincingly. David Nicholls’ script keeps her strengths and weaknesses all consistent with who she is. For a person so steadfast with living her own life outside the expectations of society, it was strange to see the bulk of the plot involve her many romantic undertakings. It’s almost an inconvenience that men fall in love with her at first sight. Bathsheba has to deal with no less than three possible suitors, all different but attractive in their own way. The first is William Boldwood (Michael Sheen), the master of the estate next door, who presents financial security but doesn’t offer much in terms of romantic passion. There’s also Francis Troy (Tom Sturridge), a military man whose strong animal magnetism exposes a brutish nature underneath the gentle façade. And then there’s Gabriel Oak (Matthias Schoenaerts). Gabriel has a level of mystery that draws our attention from the rest. Schoenaerts’ performance is so subtle that we could mistake it for flatness, but there is nuance upon closer inspection. Gabriel is a sheepherder who lost everything, and now works at Bathsheba’s farm. He is the quietest of the three suitors, but also the most loyal. Gabriel would see Bathsheba go with another man if it would mean her happiness. He relates to Bathsheba the most, because he has seen her humble beginnings. Mulligan and Schoenaerts work the back and forth between the characters with unspoken tension. They both know what the other is thinking, but aren’t sure if it’s appropriate to say it. Their dynamic is the centerpiece of the whole film. Far from the Madding Crowd is not without its faults. A subplot involving the character Fanny Robbin (Juno Temple) leaves little resonance, even when she is supposed to play a critical role. But that was not enough dissuade my overall enjoyment of this film. I never read Hardy’s novel, and I have yet to see John Schlesinger’s 1967 adaptation. But what I got with this retelling took me unawares, and I’m glad that it did. Don’t let the old fashioned dressings fool you – this one is worth a watch.